This tour is for a maximum of 7 people in a luxury Land Rover Discovery. 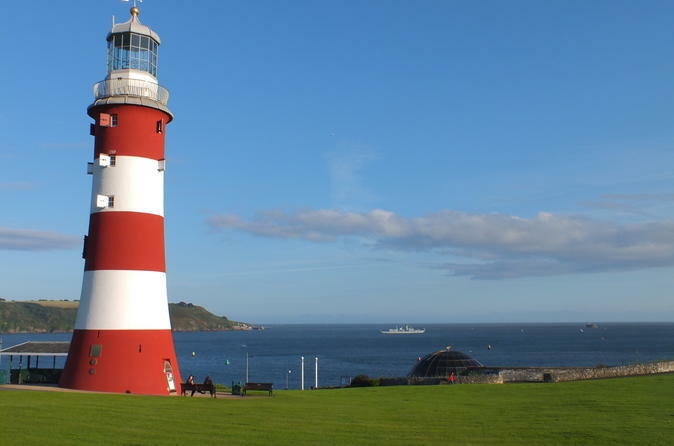 You will be collected from your hotel by your local guide, and you will journey to Plymouth where you will step on to the world famous Plymouth Hoe with its panoramic views and stunning historical significance. Hear about Drake and the Armada, see Smeatons Tower the iconic lighthouse which once stood on the fearsome Eddystone reef 14 miles offshore as well as numerous other tales of this great seafaring City. You then arrive at the Barbican visiting the Mayflower Steps and museum, seeing the Elizabethan House and visiting the place where it is said the Pilgrim fathers had their last meal before setting out for the new world in 1620. Next your guide will drive you to the historic Royal William Yard, the stunning collection of grade one listed buildings that used to supply the provisions for the Royal Navy. A short walk visits places of real historic significance, including the spot where a voyage once left which changed the whole understanding of the world. Lunch taken here or en route depending upon your preferences (not included in the price). Set off for Dartmoor and your driver guide will explain the history of the moor, and you will visit one of the famous granite tors, where you can climb up to see fantastic views of the surrounding area. The choice of tor will depend on the guests wishes and abilities, so can range from a stiff climb, to a single step up just a few meters from the car for those who are unable to scale the hills. You'll go to Princetown, location of the infamous Dartmoor prison, and hear stories of escapes attempts and dastardly deeds and then visit other areas of Dartmoor including Postbridge, before returning to your hotel.